The past few months I've been preparing for a totally new experience: a gallery show. When this opportunity first came up I wasn't sure it was the right fit for me. I never pictured myself or my work in a gallery. I don't really consider myself a "fine artist," which to me is someone who makes original art: paintings, photographs, etc. that you can see and hold the original piece in your hands. An artist creates art with more of an eye toward making "art" than making it commercial. This of course isn't exactly true or at least not the whole truth. There is a lot of overlap in fine art and commercial art. There are artists who sell work, artists who don't. Hobby artists, professional artists, commercial artists who make beautiful and incredible work. The artist definition and whatever standard we apply to it is not very helpful. I, like many others, also have a hard time calling myself an "artist" in the first place. 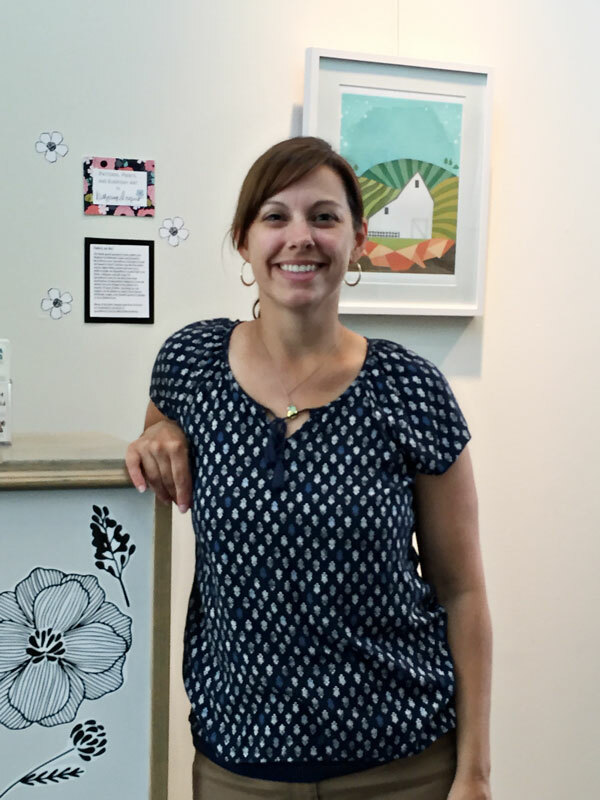 Lisa Congdon wrote a great article about this: On Owning It: I Am An Artist. I didn't go to art school, I haven't sold original paintings, I make prints of my art because I work digitally, I'm only getting started as a licensed designer - it's hard to claim a title that you feel implies more than what you see yourself as. But as Lisa suggests, I'm trying to own it. Which led me to this gallery show. The Chaska Community Center has become a second home to me. When I first moved here about 11 years ago I got a job at the CCC working with kids and I've continued to do that on and off over the last decade. 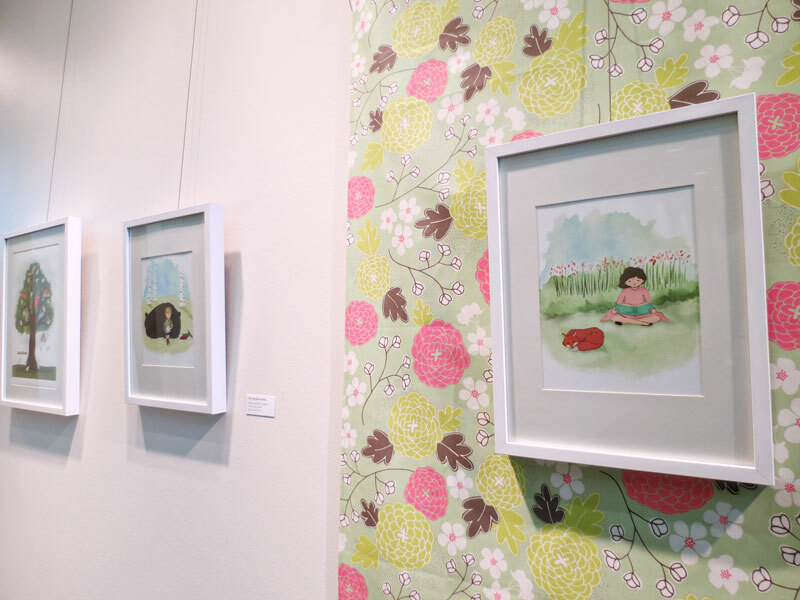 I currently teach art classes and camps to preschool-school age kids and really enjoy it. I also do the Tot Time Art program every Monday morning, a free drop-in art/craft time for preschoolers and their parents. 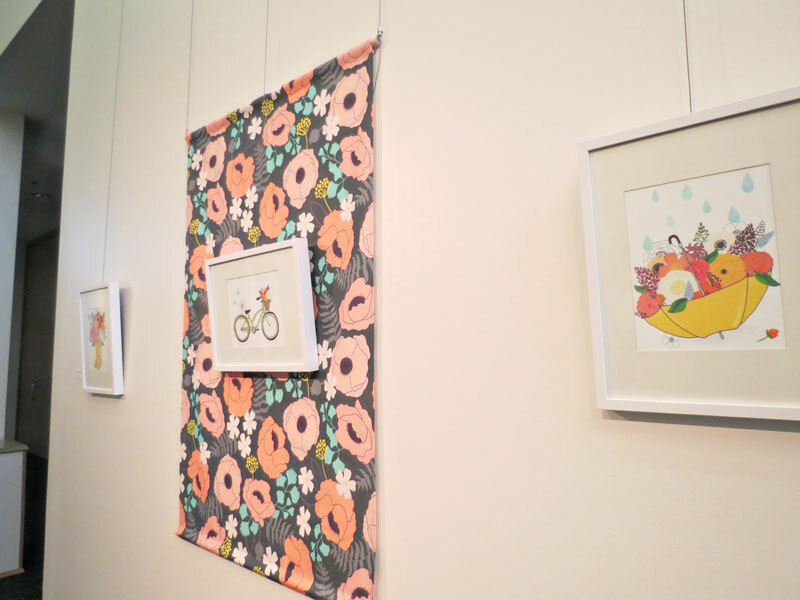 The offer to show my work in their gallery was such a wonderful chance to share what I do with the community where I live that I couldn't pass it up, even though I was terrified by the idea. Because the scale of my art is on the small size (I generally print 8x10 and 11x14 inch prints) I knew I would need a lot of pieces to fill the space and I started brainstorming about ways to show my art. 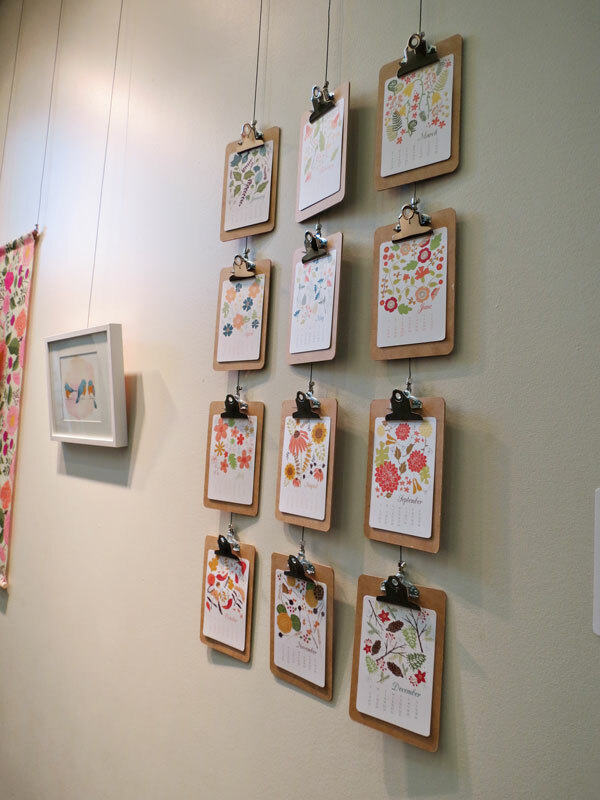 I wanted to convey how I create art that can be used on everyday objects (like tea towels and calendars) because I actually really like that aspect of my art. I like that it might get used by someone everyday or sit on their desk or hang in their kitchen. 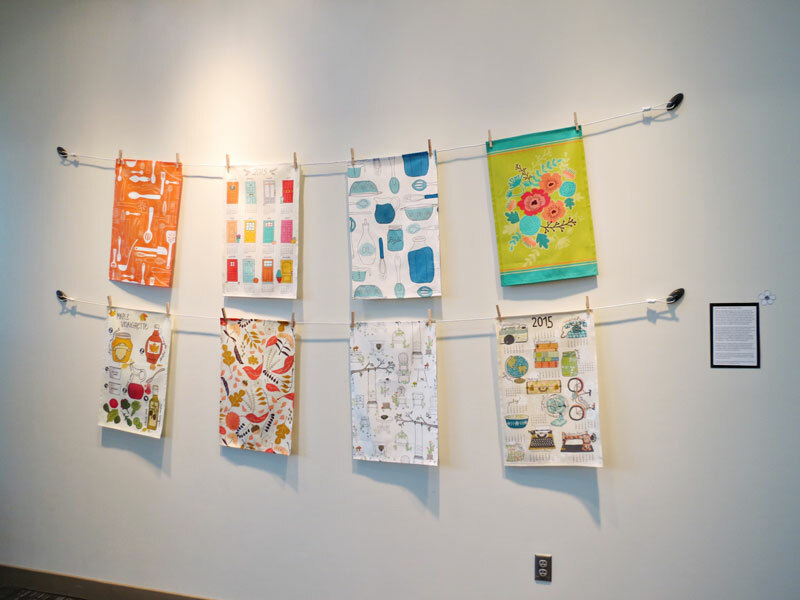 One wall of my show is a clothesline with tea towels hanging by clothespins. I also decided to have large fabric panels printed with my patterns because I wanted to share my fabric designs and I had wall decals printed by Spoonflower.com to decorate the pedestals in the gallery. In the end I'm really happy with how the show turned out and I'm proud to say that it's my work. So far I've received a lot of positive feedback on the show and while I don't expect to do a lot (if ever again) of gallery shows, I've really enjoyed the process of preparing for the exhibit. I created a lot of new work and it was fun to get a wider perspective on my work as a whole. If you're in the southwest metro, please stop by to see it! 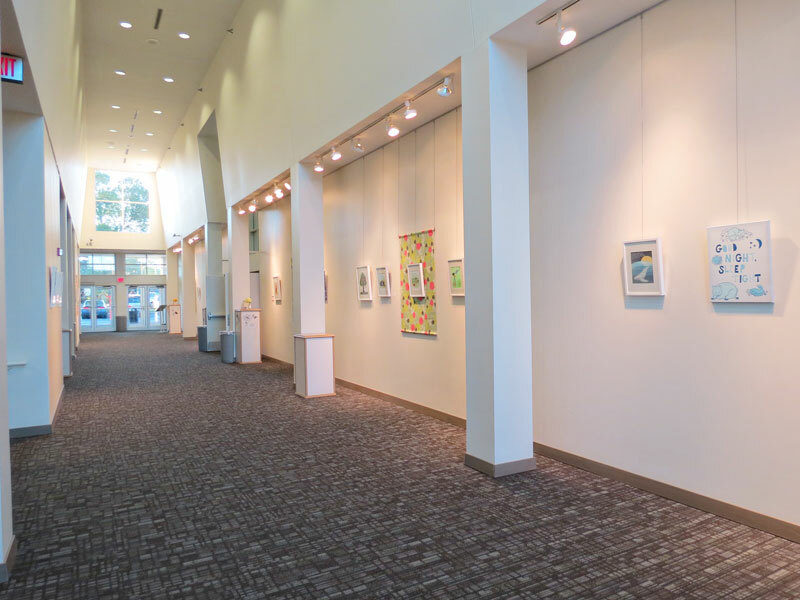 The exhibit will be at the Chaska Community Center through August 29. If you can't make it to the show take a virtual tour with the pictures below. * All of the work in the show is available as prints (and finished tea towels) in my Etsy shop. Fabric (including the tea towels) is available in my Spoonflower shop.